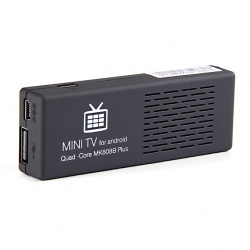 Today you can find several other inexpensive and decent H.265 capable Android based media player set-top box for less than $50 built on the Amlogic S805 SoC that are all capable of playing HEVC (H.265) videos, but MK808B Plus may just be the cheapest H.265 capable player on the market, as this Amlogic S805 based Android TV stick can be found for around $35 USD including shipping from many different Chinese online stores. The MK808B Plus device ships with a micro USB OTG adapter, an HDMI-cable, a USB power-adapter with a Mini-USB cable, and a user-manual. Compared to full-size Amlogic S805 players, you do not get a wired Ethernet (RJ45) port, no optical SP/DIF audio autport, or more than USB host ports. The original default firmware runs Android 4.4 with the MediaBox user interface, and it usually comes pre-loaded with an older version or XBMC Kodi. Most users can simply install the normal Android version of Kodi onto the MK808B Plus. HEVC (H.265) hardware decoding requires a nightly development build of Kodi. This page was last edited on 10 July 2018, at 04:01.